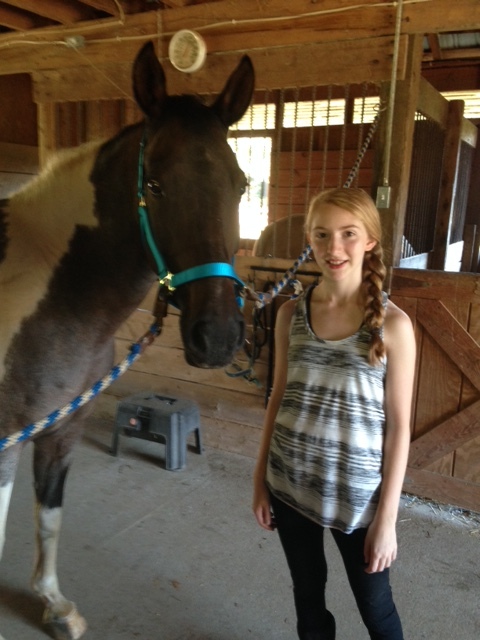 Sydney, with April, on her birthday. 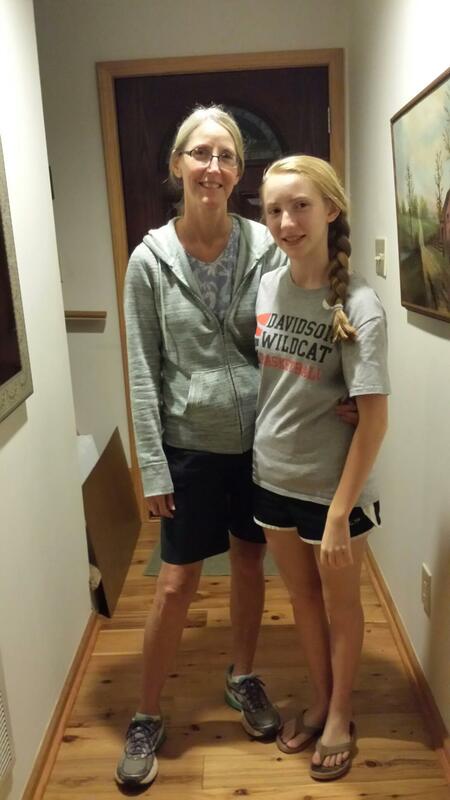 On the cusp of my forty-first year, after multiple miscarriages and as I watched my own mother slide into the sad, indecipherable world of Alzheimer’s, I was granted the gift of a daughter. 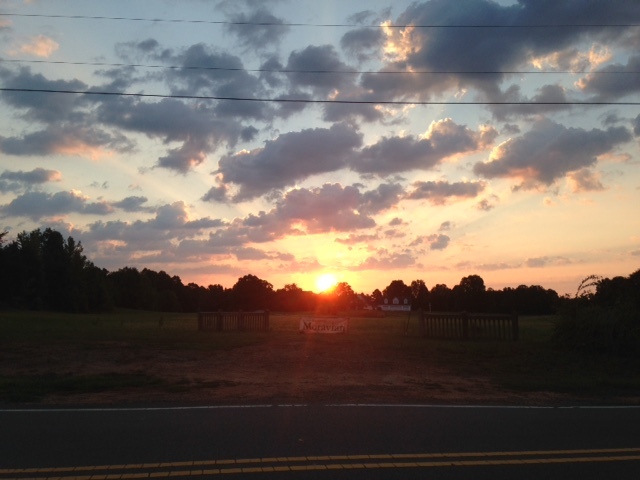 I had grown to expect grief, to steel myself for it … and instead I received a miracle. A being of pure light. 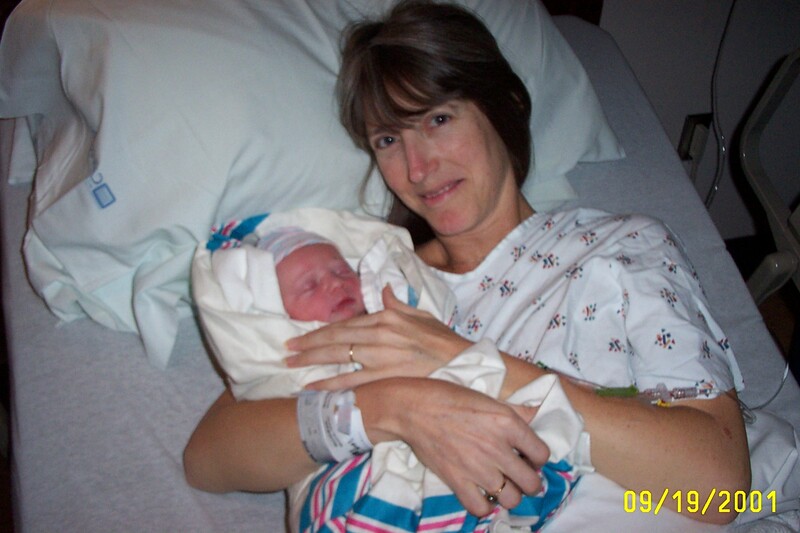 On the day of her birth, I told my husband she was “made for my eyes.” I still feel that way. The twin towers of my childhood had fallen — my father’s heart had given out the year before and my mother’s mind was disintegrating — and our country had just experienced the horror of 9/11. 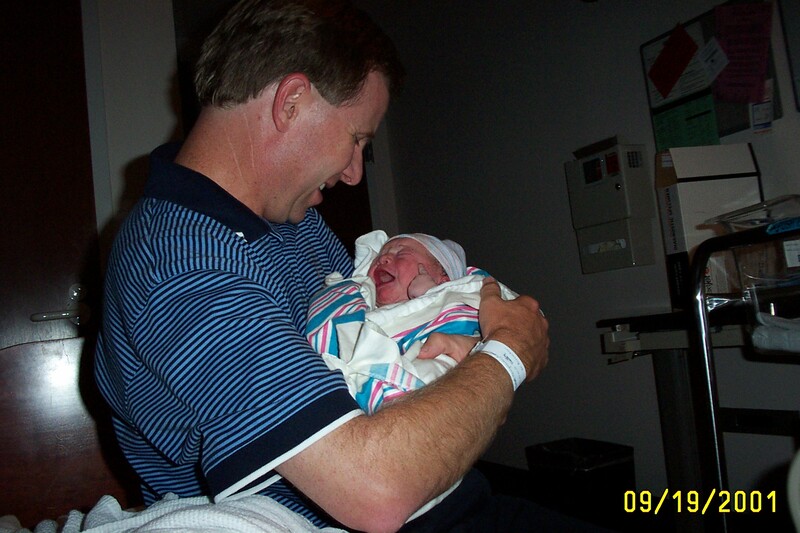 A week later, Sydney entered our lives. Our hearts were more than full. I have told the story in my memoir, Motherhood: Lost and Found, spent years editing the manuscript, trying to capture the nuances of this story. But words seem so small compared to this kind of Grace. Every day with our daughter is a joy. A celebration of life! Yes, there are challenges. I have much to learn as a Mother. And we are a very human family. But underneath whatever happens, we know we have been deeply blessed. And we are so grateful! Fourteen years later…on my birthday, three days after Sydney’s. 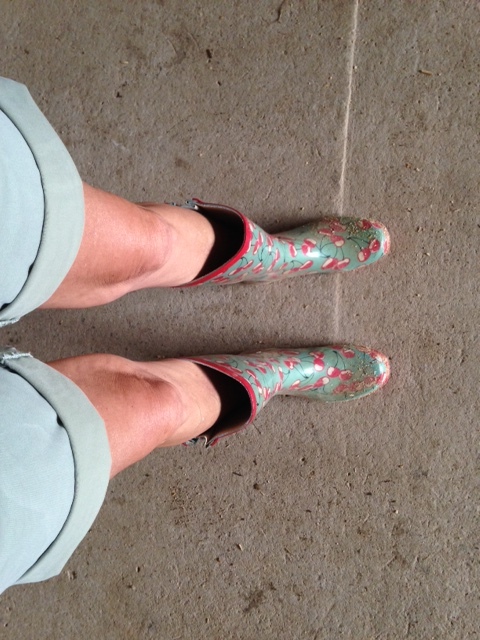 Not exactly a fashion statement…but they keep my feet dry. 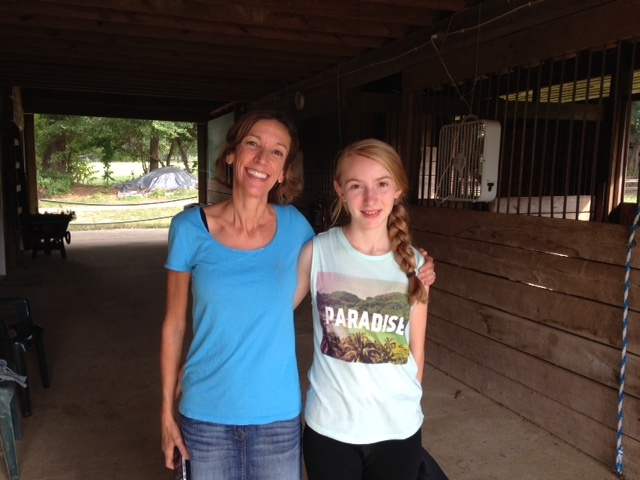 My dear friend Lyn stopped in to see Sydney and me at the farm a couple of weeks ago. It was so wonderful to see her! 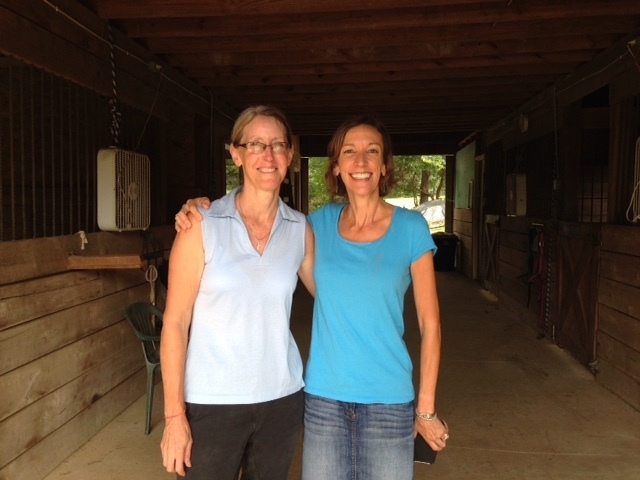 Lyn and I used to ride together back in our college days. So good to see her! 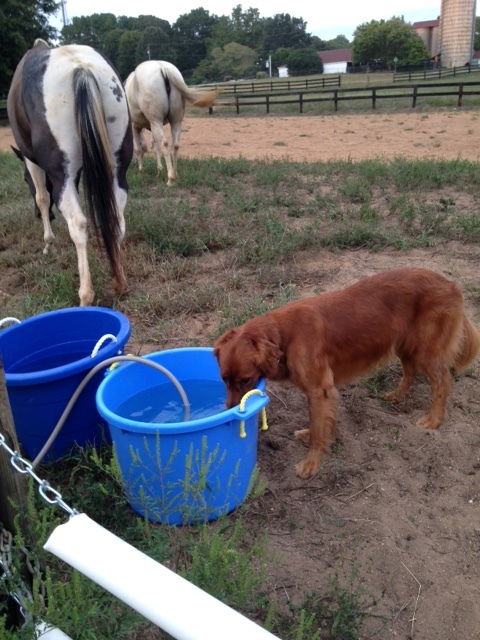 Sunny taking her turn at the water bucket. She thinks she’s a horse at times. 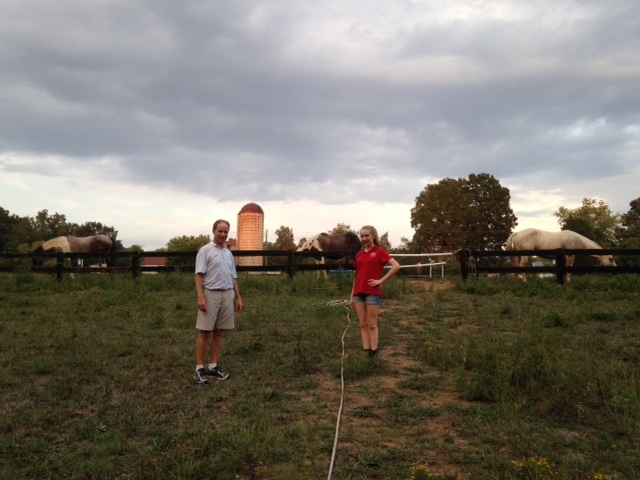 Joel and Sydney helping me run water up to the ring. 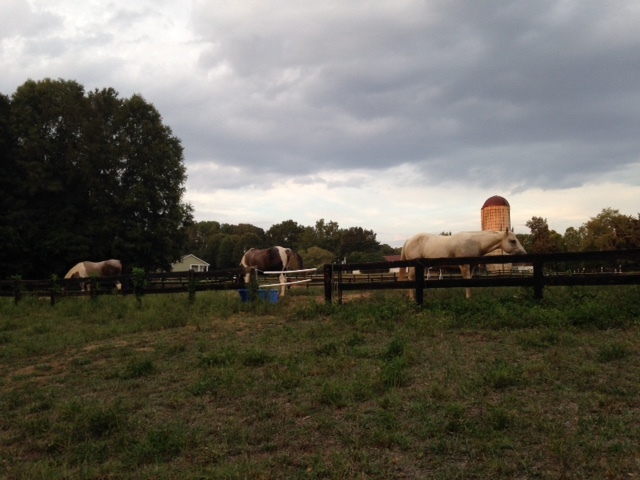 With this dry weather, I’ve been rotating horses into every available space…hoping to preserve some grass. 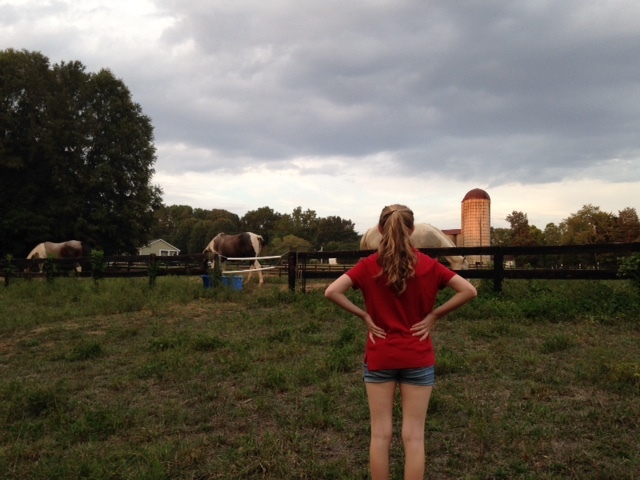 Sydney surveying our small herd. Hay is a welcome sight this year. I’ve been more attuned than usual to the weather since we’ve been suffering from a drought all summer. 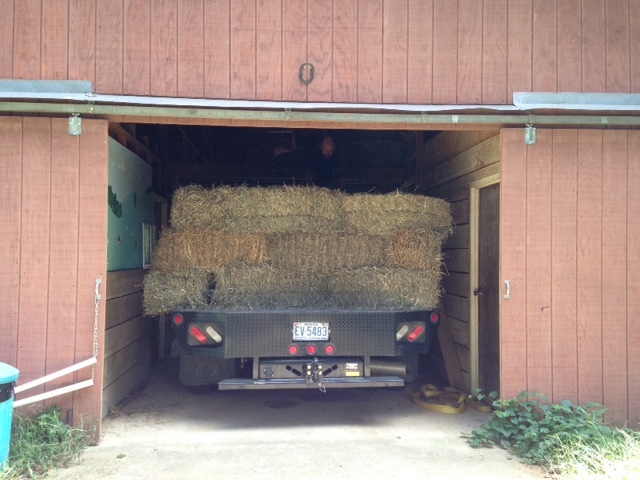 The hay truck arrived this afternoon with 60 bales of a rich orchard grass mix. And more bales are on the way…. It was a tight squeeze. 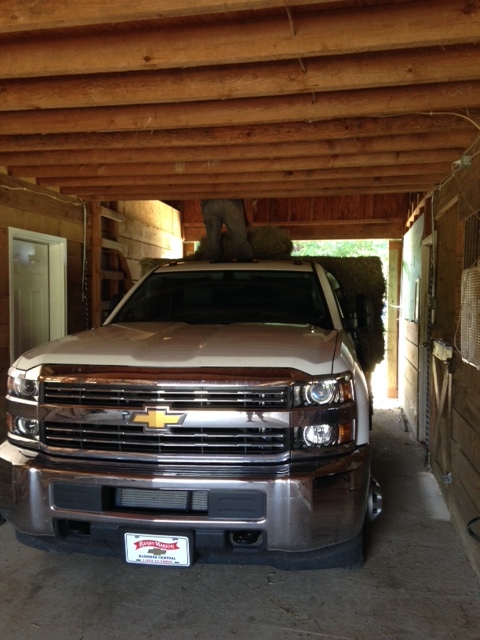 But the truck made it into the barn with several inches to spare. 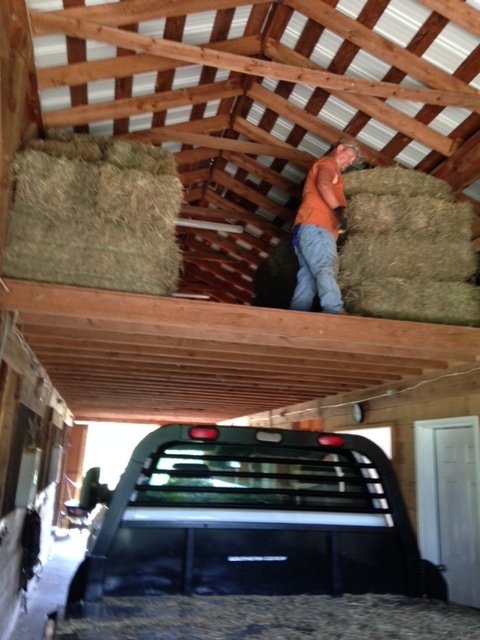 The hay was unloaded into our loft. I was thankful for the strong men who did this hard work. 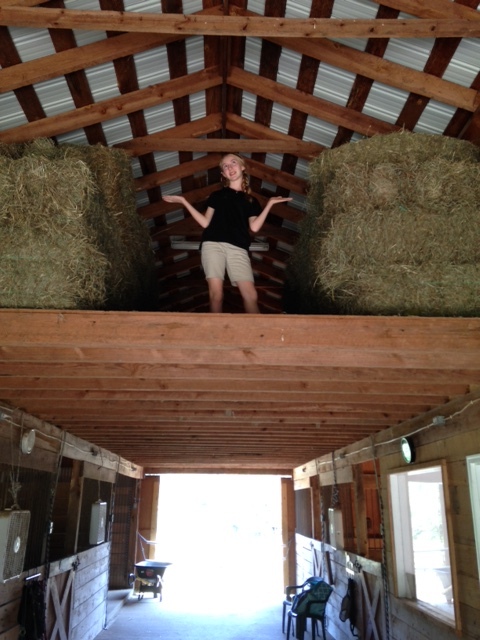 One stood in the bed of the truck and tossed bales up to the loft while the other stacked them. Each bale weighs about 75 pounds, so it’s not easy work. 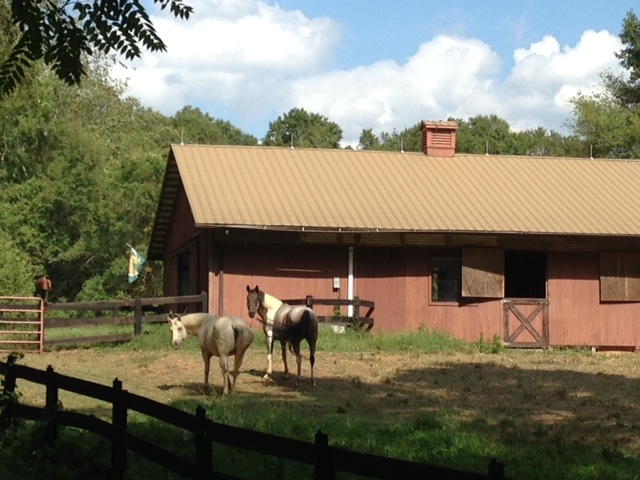 When your pasture looks like this…hay becomes even more beautiful. It’s been weeks since we’ve had an appreciable amount of rain. 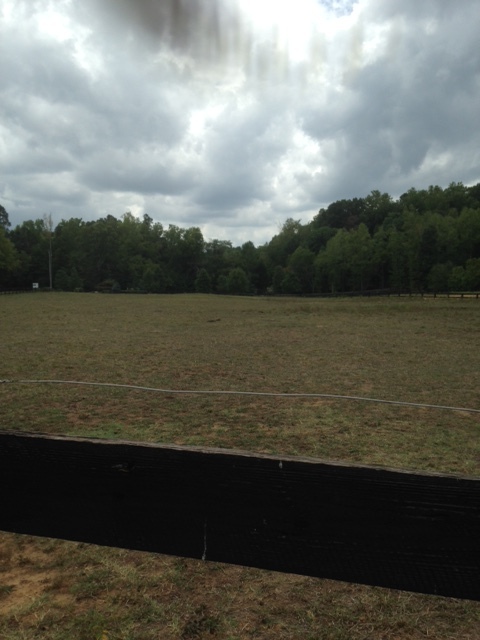 Normally our pastures are green and lush. The hay is neatly stacked. A full loft is a wonderful sight…especially when winter is ahead. Sydney shows off our lovely hay! It’s been pouring rain since I started this blog post. Maybe the key to breaking the drought is getting a hay delivery. 🙂 Whatever it takes! 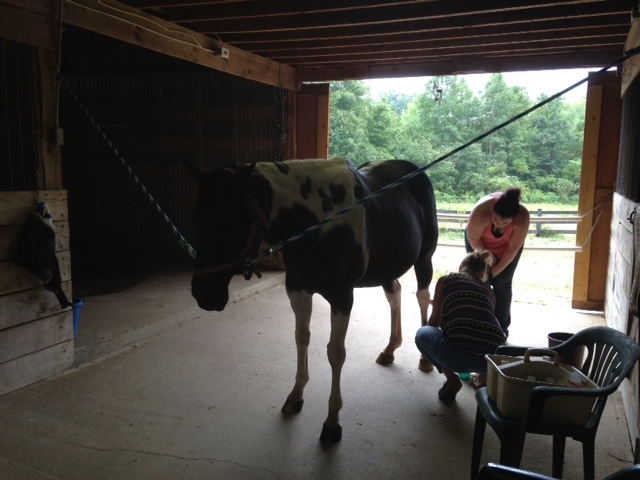 During Misty’s recent vet exam we learned that her hocks were sore. The vet recommended a round of injections to help her feel better. 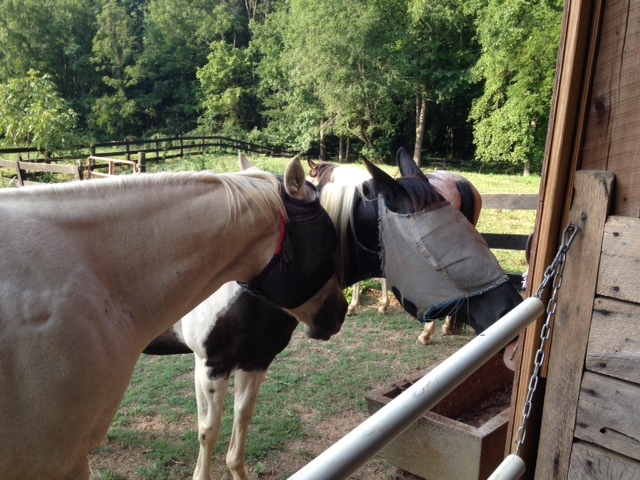 He came out today and treated her. I took a series of photos so that I could share the experience with Karen and LK who are out of town. Misty was a good girl. 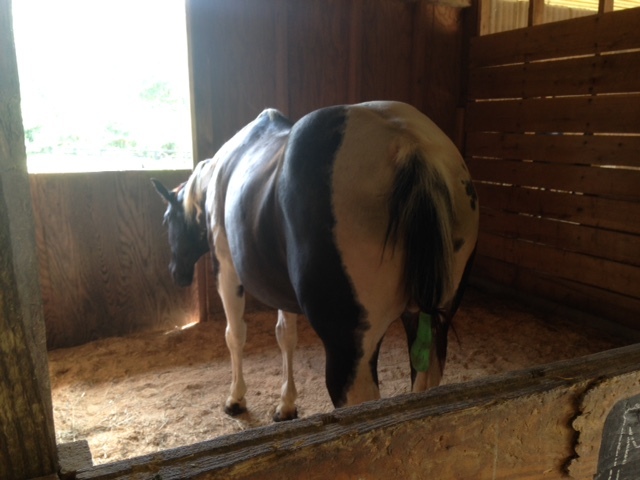 The vet techs prep Misty by wrapping her tail and scrubbing her hocks well. Misty is feeling pretty sleepy after being injected with a sedative. 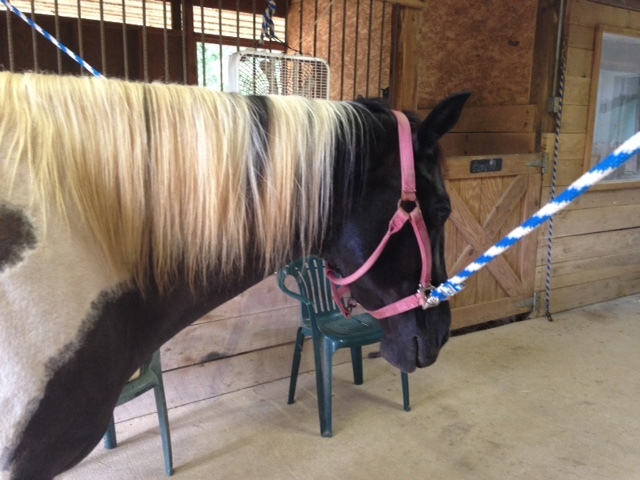 The crossties hold Misty’s head up. The vet techs continue scrubbing. 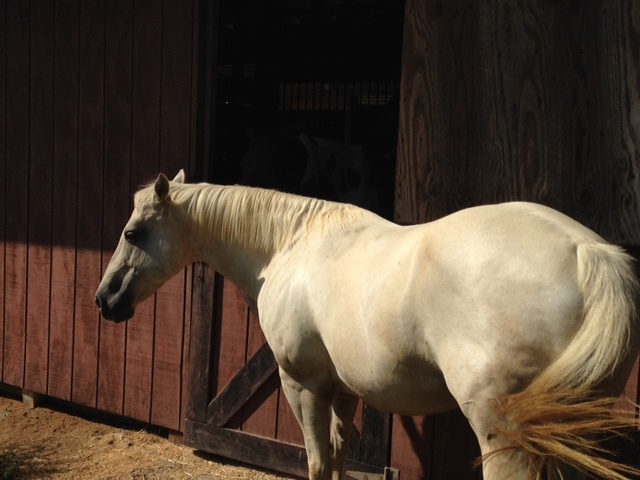 Misty’s hocks are cleaner than they’ve been in a long time. 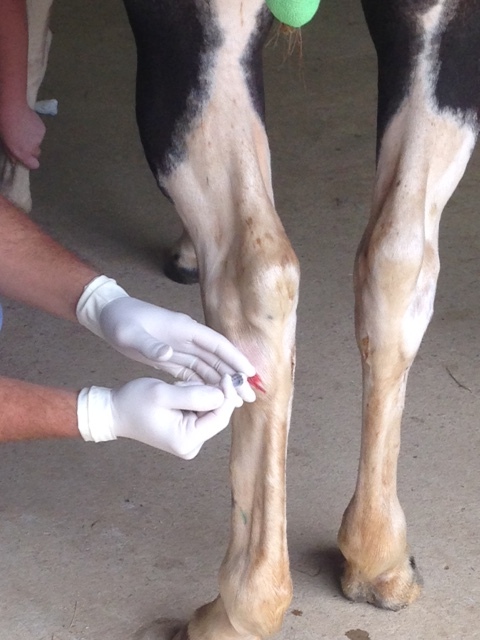 The vet gets the needle in. 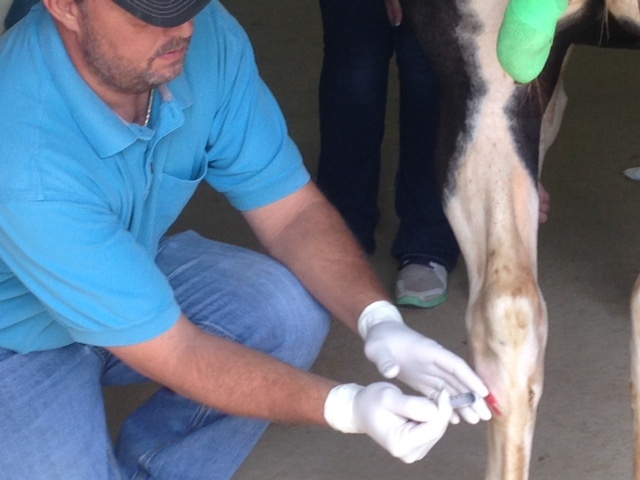 Misty isn’t too sure about being injected in this hock. But the vet is patient. Suddenly Misty kicks out! The vet decides to give Misty a little more sedative. 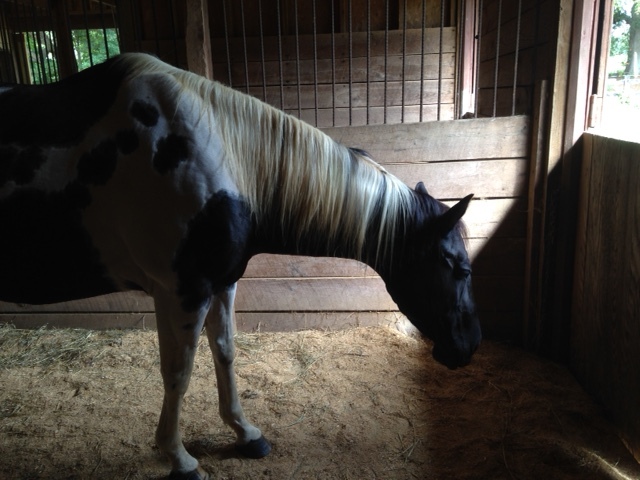 After the vet leaves, Misty goes into her stall. She is sleepy. 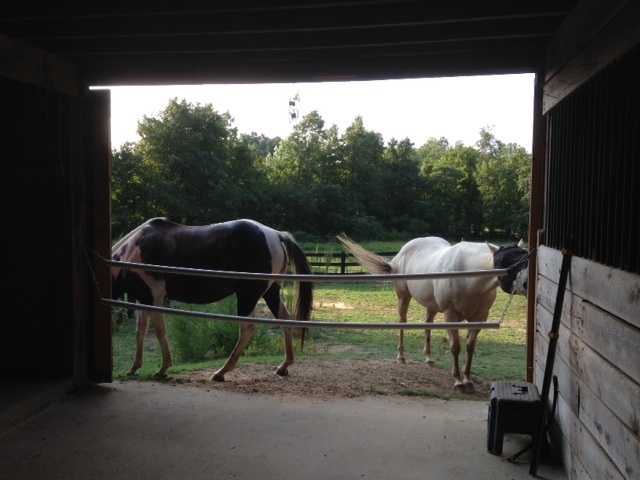 I turn Foxie and April out behind Misty’s stall so they can all see each other. Foxie comes over to say hello and April grazes close by. 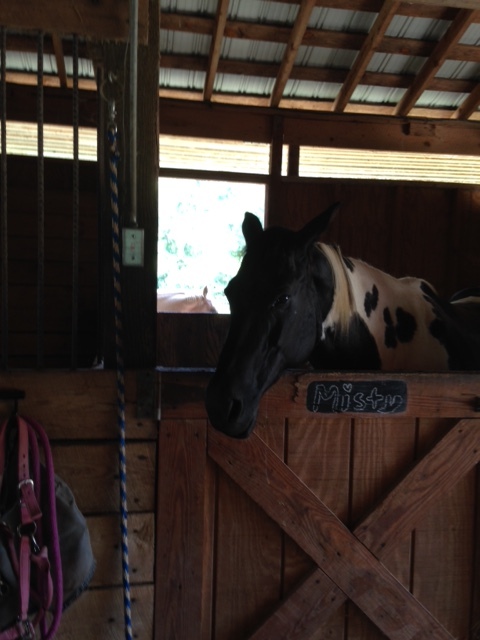 Foxie stays right outside Misty’s stall for a while. Misty is starting to wake up. 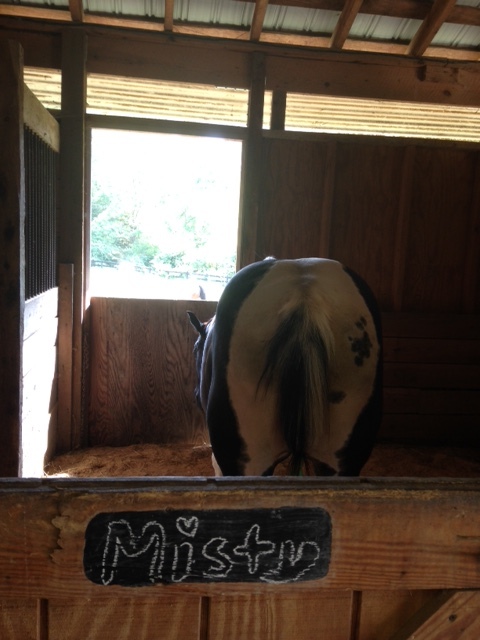 And Foxie peers into her own stall wondering if there are any treats in there. A few hours later, Misty seems to be back to herself. 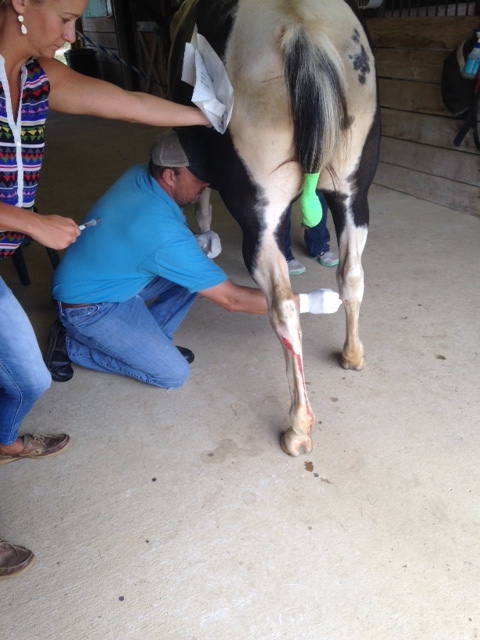 Hopefully her hocks will be feeling much better over the next few days. 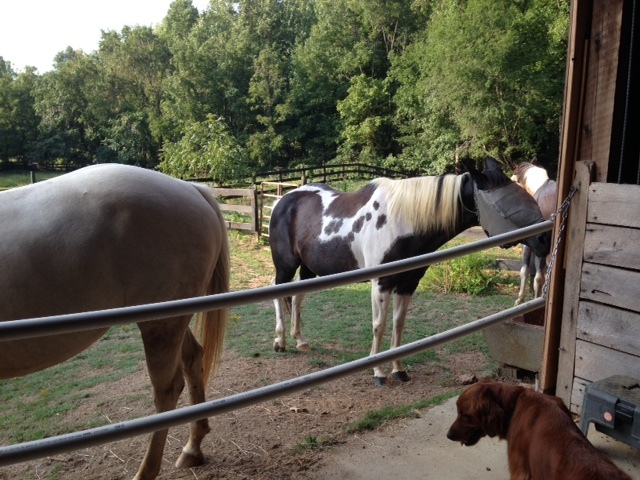 Foxie moves in for her turn at the salt lick. 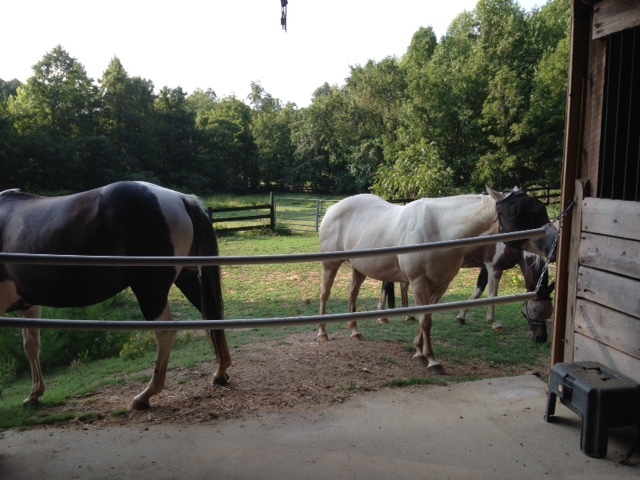 Because she’s the alpha horse, she takes her time…and the others wait patiently for her to be finished. Finally…Foxie moves away and it’s Misty’s turn. 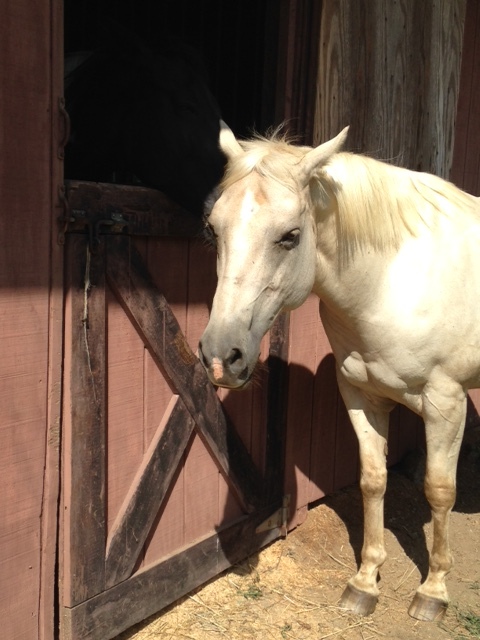 April waits in the wings…staying close. 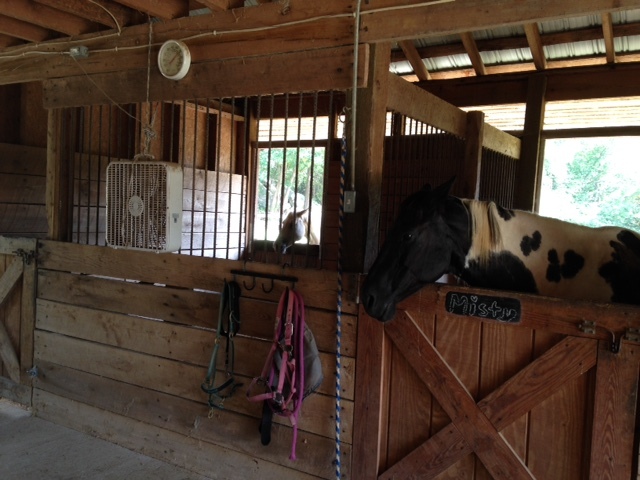 Sunny keeps an eye on the horses too. Foxie comes back and parks her head in Misty’s neck while April continues to wait. 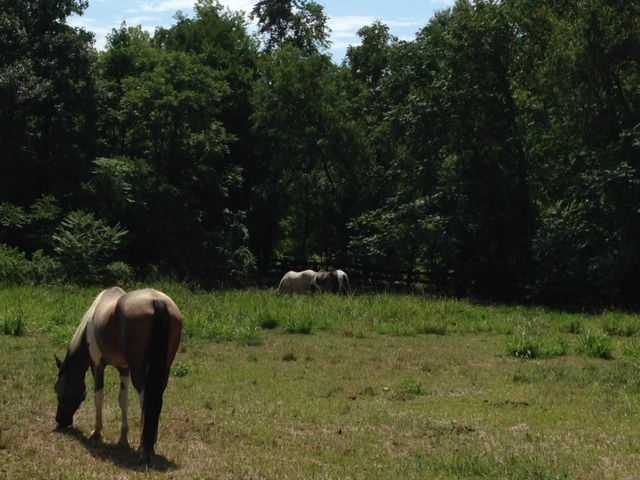 Foxie and Misty wander into the pasture…and April decides to follow them, forgoing the salt lick. She doesn’t want to lose sight of her friends.